Solid™ Marker Slim markers are known in the industrial world as tough markers for tough jobs. Now, Sakura is pleased to offer this solidified paint stick in a slimmer barrel and tip for smaller marks and home use. Sakura Solid Markers mark virtually any surface, anywhere, and at any angle. They can mark through dust, rust, and water! The easy twist action Solid Marker paint stick dries within minutes and is permanent once dry. These Sakura solid markers won’t fade or wash off like chalk and are ideal for use on wood, cloth and canvas, plastic, steel and iron, rubber, cardboard, glass, and concrete. 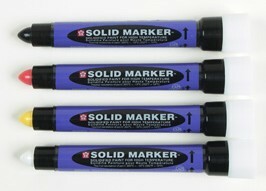 Solid Marker Slim are quick-drying and virtually odorless. Working temperature range: 14°F to 392°F (-10°C to 200°C). Colors available: Yellow, Red, Black & White.